The Fluke Networks PTNX8-DLX Pocket Toner NX8 Deluxe Kit is an expansive kit for testing on home theater systems, audio systems, both cable and telephone installations, and much more. 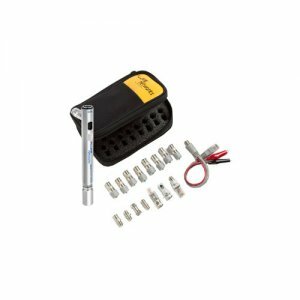 The Fluke Networks PTNX8-DLX can be considered the ideal kit for identifying and for the advanced testing of singular cables in a kit with the widest array of adapters. Fluke Networks' PTNX8 Deluxe provides an adapter for virtually any audio/video or telecom testing need conveniently stored in a durable compact canvas case.